PASSERSBY STROLLING WEST CLIFF DRIVE WHO STOP TO STARE AT one of those precariously perched rock stacks have Stuart Finch--a.k.a. Rock Man--to thank for getting them to slow down. "I build my faith upon a rock. I live off my blessings bucket. I have no other income," says Finch, whose rock stacks get visited by 200 people a day in the summer. The sandy-haired Finch, who says he's been stacking rocks for 20 years, is planning to stack stones from Santa Cruz to Ventura along Highway 1, and then inland to the Grand Canyon. "It's the Rock Man tour. I'm gonna travel by bike pulling my trailer behind me full of lights, candles, tools, camp gear, food, water, clothes, books, and my portfolio of news articles, and everything I need to survive out in the wilderness. "I'm used to sleeping outside where I can hear animals. When I sleep inside my nose gets stuffed up. But I'm not homeless. I'm housing impaired. To me homeless means you don't belong on earth, like ET." 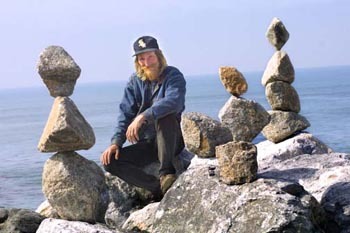 Finch, who does most of his rock stacking a quarter of a mile north of Steamer Lane, says he loves Santa Cruz. "Even the president doesn't have a big screen like I do. There's no negative in it, " he says, gesturing toward the ocean, which provides a constantly shifting backdrop for his art. "People treat me very well in this city, though I've been visited by city officials twice, who gave me a height and size limit for my stacks," says Finch, who once stacked rocks 12 feet high. "I wish the city would let me erect a fence with a sign saying 'Rocks Will Fall'." Four things make rock stacks fall, according to Finch: gusty winds, crashing high tides, passing trucks and partying teenagers. "What goes up, must come down. "When I go out in the morning, my mind is a blank. Then I see a rock and I pick it up. I feel the weight and I look at the shape, and picture the rock having a center, top and bottom. I've tried stacking rocks in the woods, but there's something about the ocean, sand and sky that make the rock piles really stand out." Finch, whose picture and rock art have been posted on Internet sites as far afield as Africa, used to get nervous when people stopped to watch him at work. "But now I'm world-renowned, I try not to show it." All the fame doesn't seem to be getting Stuart Finch down. "I like being famous. It makes my life positive seeing people smile. I'll probably stack rocks until the day I die." From the March 21-28, 2001 issue of Metro Santa Cruz.